There has been a lot of talk about soaps going around lately, but in honor of Chinese New Year I think it appropriate to bring out the story of How the Dragon Got Its Name. 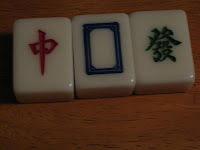 We all know that mahj originated in China, and as such there are distinctive Chinese elements to the game. But because the game has a long history and myriad variations, these elements have been adapted to suit the cultural preferences of the time and place. So - what are dragons, really? The information wasn't difficult to find, and the words that follow are not mine. I found all this stuff on line and it's fascinating. The symbol that we now know as "red" is a flagpole inserted into a holder. "White" is the meat of an acorn. The oracle bone symbol for "green" is not known. In addition, the three tiles stand for something more physical and that is archery. 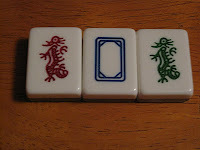 The red symbol is a direct hit, the blank tile is a miss and the green symbol is that of the archer drawing his bow. The symbols also correspond to Confucian virtues; red for benevolence, green for sincerity and white for purity, or freedom from corruption. I would speculate that the use of the word "soap" for white dragon is adapted from the idea of purity or cleanliness, but that is just my humble opinion. And because it is sometimes depicted as a blank tile and represents a miss in archery, it is a natural go-to tile for use as a null or zero when needed. So how did these symbols become known as dragons? I cannot say for sure. It says on Wikipedia that it was introduced by Joseph Babcock when he first imported the game to the West in the 1920s. 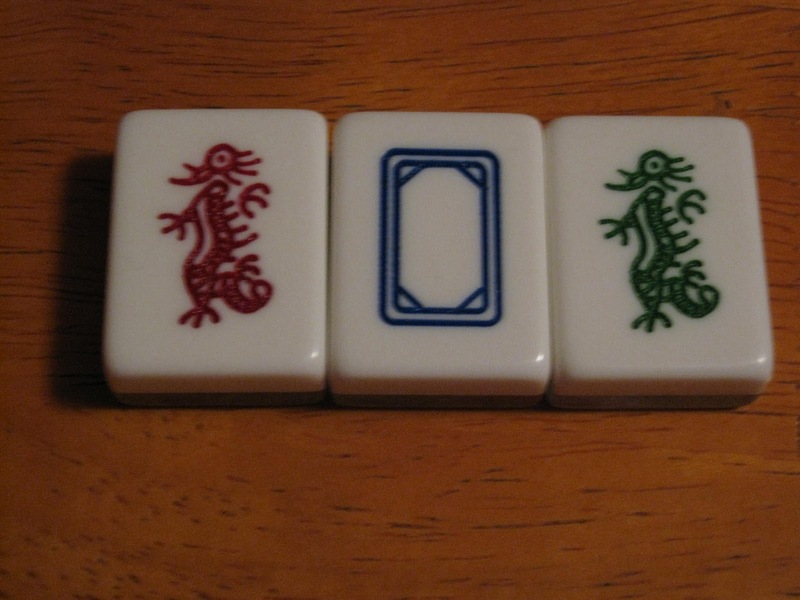 Dr. Foster in his 1923 book Foster of Mah Jongg refers to the red, green and blank tiles as Dragons but says it is not necessary to refer to them as such; merely as red, white and green. I am thinking that Babcock wanted to spice up the tile set and make it seem more exotic and what could be more "Oriental" than the all-powerful dragon? I may be wrong, but hey, marketing is marketing. So here's the the year of the dragon - may you draw your bow, hit the mark and stay free from corruption. A major difference between Asian style mahj and American (NMJL) style mahj is that we use jokers and they don't. When the game was imported to the U.S. in the 1920's jokers were not part of a set, and for many years flowers were used as jokers. Check out this information from a chart posted by Tom Sloper. It lists the card years, and the number of flowers and jokers used that year. What would make the League go from 20 flowers in 1949 up to 24 in 1950 and back to 20 in 1958? I will be asking Mrs. Unger that question at this year's Annual Meeting, so stay tuned. .This chart also explains why you will see so many flowers in an older set. And why you might see a flower with nail polish on it to signify a joker tile. Imagine getting a new set every year to accommodate all the changes? Oy. So here are the basics on jokers - from the obvious to the obscure. Jokers can only be used with three or more identical tiles. 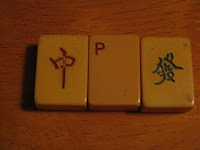 You cannot use jokers with 2011, 1223, NEWS or any pair - even if it is your mahjongg tile. 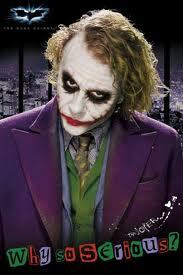 If someone throws a joker, it can never be called. If someone puts out an exposure with a joker, you may exchange the natural tile for the joker (yes, even if you are playing a concealed hand) But first - Pick a tile and think through your strategy. Look at the table. If your opponent has 2 three craks and a joker, do you see another three crak on the table? If no, take the joker before someone else does. Does the joker open your hand for calling? If yes, take the joker. Are you playing a jokerless hand? If yes, wait and see. If you will be set (one away), throw the tile. If you go dead, take the joker and open your hand. If you are two tiles away you can benefit by holding the natural tile. Calling for exposure, then exchanging the joker and claiming mahjongg will give you a self-pick win. Sharon has three flowers out with a joker. You are playing a hand that needs four flowers and you have three. No flowers are on the table. Take the joker before someone else does. A joker is always safe to throw at the end of a game. Pretend you didn't see it so you won't let on that you are waiting for a pair. Oh, gosh, you had six craks out? I thought they were eights! Do you really want to expose with a joker at the end of the game when the fourth three bam is not on the table? Some smart cookie is holding back the tile waiting for the joker to exchange. Don't assume that five jokers guarantees your win, but do try to work your hand around them. That's what quints are for. Do you have any joker do's or don'ts? Share them with us! 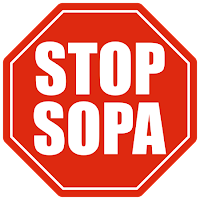 And please take a moment to contact your representative about the limitations of the Stop Online Piracy Act. 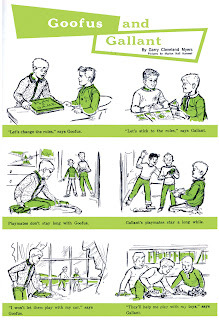 Who doesn't remember Goofus and Gallant, the moral arbiters of the baby boom generation. While they may be tame and almost laughable by today's standards, the comparative illustration of their behavior yields timeless lessons. How does it apply to mahjongg, you ask? Well. Goofus agrees to play, then calls five minutes before the game and says, "I forgot I have tickets to the opera." Gallant checks his calendar before accepting and says, "I'm free and I'd love to play!" Goofus coughs and sneezes all over the tiles and says, "I just can't get rid of this cold!" Gallant remembers to sneeze into his sleeve and uses Purell before touching the tiles. Goofus pulls out a $20 bill on a $3 pie and asks if you have change. Gallant makes sure to bring nickles, dimes and quarters. Goofus will contact a casual friend or stranger and expect her to find him a game. Gallant will be proactive and take a class, find a community center or start a meetup group. 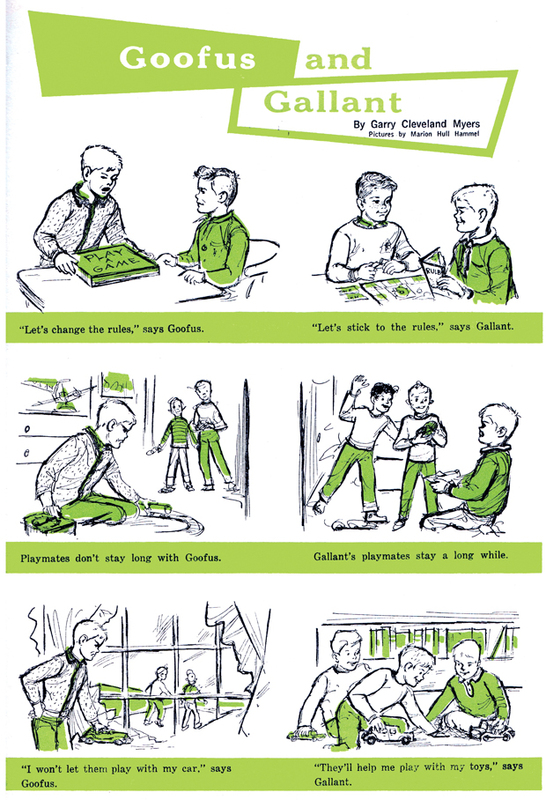 Goofus will corner a good player on a break and whisper, "Play in my game - and don't tell the others!" Gallant will either invite everyone present or issue invitations privately. Goofus will point and say, "Ha, ha! You could have taken her joker!" 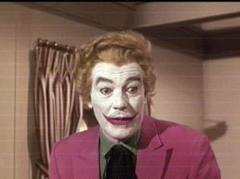 Gallant will remain silent and assume the joker was not needed. Goofus will snarf down all the Crunch 'N Munch and never bring snacks or nosh. Gallant, realizing the hostess is on a budget, will ask, "And what may I bring?" Goofus will spread rumors and say, "What a cheater! She can't possibly win so much!" Gallant will admire the achievements of a good player. Goofus at the end of the game will ask, "Who's driving me home?" Gallant will make appropriate arrangements in advance. 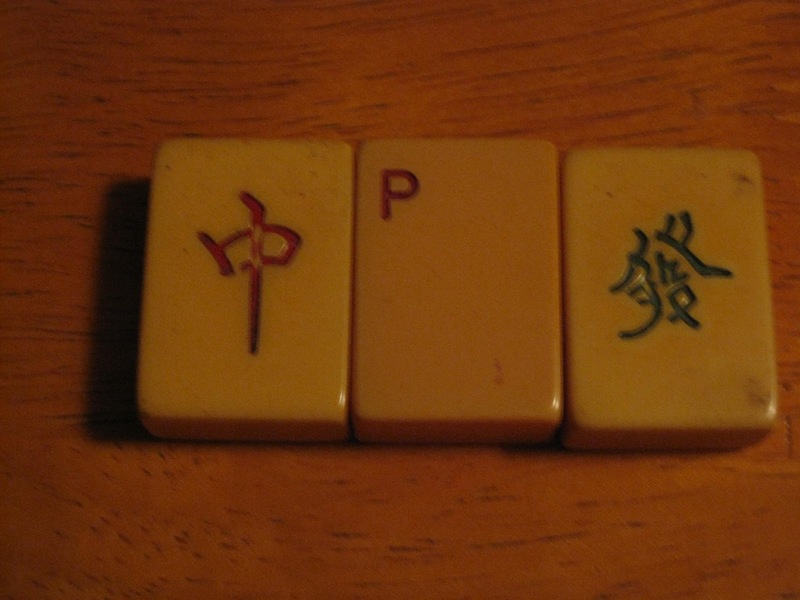 The etiquette of mahjongg is self-explanatory. If you want to play in more games, don't be a Goofus! You are welcome to post your Goofus moments - anonymously or otherwise.